Is there anywhere Stephen Fry will not go? I mean in documentaries. We’ve had Fry on depression and Fry on America, Fry on HIV and Fry on endangered species. Movingly, we’ve had Fry on who he thinks he is, an odyssey in which he discovered that much of his family fetched up in the gas ovens. Fry on Wagner? Admit it, you weren’t surprised. You didn't think, not another bloody comedian investigating, in pursuit of ratings, a subject of which he knows next to nothing. Fry, as everyone knows, knows everything. “My love affair with Wagner”, he began, “began when I was a child.” Of course it did, Stephen. The thrust of this instalment of BBC Four’s Opera season was to introduce Wagner to newcomers. Fry was of course the perfect choice for this sort of work, as he has long been positioned as elitism’s best apologist. People will take a lecture on Der Ring des Nibelungen from the voice of the Harry Potter audiobooks. There was even an echo of Rowlingsland here. When a picture of Wagner’s most infamous fan appeared on screen, Fry referred to the Fuhrer merely as “Him”, much as in Hogwarts they call you know who "You Know Who". Since Who Do You Think You Are? Fry has been in touch with his Jewishness - or at least in touch in public, which is where the nation’s Tweeter-in-Chief mostly seems to live. 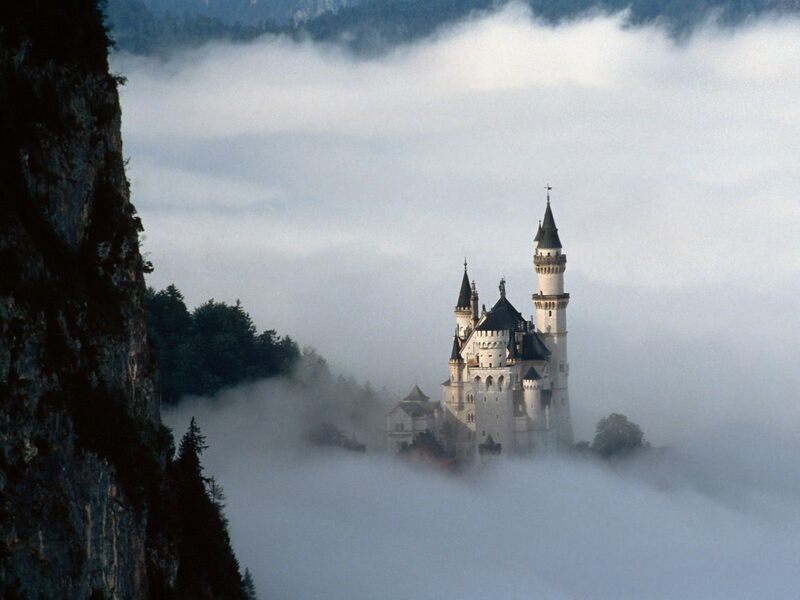 So in this tour of the Wagnerian horizon there were the expected trips to Bayreuth and (pictured below) Mad King Ludwig's folly Schloss Neuschwanstein (no mention of Chitty Chitty Bang Bang, for some reason). The film followed Wagner to St Petersburg. But there was a visit to Nuremberg too, where it was argued that Nazi rallies derived their aesthetic, all banners and massed civic marches, from Die Meistersinger. Fry quietly refused to do the tourist thing of standing on the podium where Hitler frothed and foamed to the serried multitudes. In London he also went to meet Anita Lasker-Wallfisch, who as a child had survived Auschwitz because she could play the cello. Fearing the worst, his hope was to quash a rumour that the Jewish ensemble in the camp had been forced to play Wagner as the chimneys belched their evil smoke. She confirmed that they hadn't, if only because the music requires too many musicians. The child in Fry who fell in love with Tannhaüser was much to the fore. Licensed in Bayreuth to drop in on a rehearsal of plump peroxide Valkyries in black leggings, there was wide-eyed schoolboyish excitement. “Fabulous,” he said quite a lot, plus “wow” and “this is amazing”. Fry’s passion crystallised most clearly when sitting at Wagner’s Steinway, where he played the so-called Tristan chord – “the cluster of notes”, he explained, “which opened the door to modern music.” A pianist rattled off bits of the Prelude and then the Liebestod to illustrate just how long it takes for that moment of dissonance finally to resolve itself. “You’ve made me the happiest man in Germany,” Fry told him afterwards. It was almost as if he’d enjoyed a tantrically postponed climax. “There’s nothing to say,” replied the pianist, more or less torching a post-coital cigarette. “No, that’s exactly the point,” agreed Fry. The pianist brooded for a moment like a bloke reaching for the poetical mot juste to sum up a tumultuous shag. “It’s extremely good music,” he concluded. They laughed happily. And that was Fry’s conclusion: that Wagner’s extremely good music, effulgent with passion and beauty and power, is a force for good, that for all the stain of association with genocide it remains fundamentally "on the side of the angels". For those who know their Wagner, there was nothing new here. For the rest of us, it was good work. Sadly, Fry is besotted with Wagner - one of the greatest artists ever, but an evil genius. Nothing to do with anti-semitism or Hitler, though it is not surprising that Adolf was so much a Wagnerian. Wagner in his music and in his dramas denies the Enlightenment, exhalts emotion over reason. indeed wallows in unreason. Wagner evokes the dark forces and stupidities of our primitive evolutionary past and diverts us from the path of detachment and purity. It is not surprising that these artistic and philosophical forces led to the horrors of the twentieth century. You clearly have a problem with Stephen Fry but I don't see why. This was never intended to be an in depth essay to psyco-analyse Wagner or analyse his music but was a documentry to just skim the surface and allow your curiosity to do the rest. This was a part of the Opera on the BBC season to inform and tempt those who have not yet realised the beauty of Opera. I am enjoying the Opera season for what it is an introduction, a piece of light entertainment and above all a chance to see not only the opera itself but the backstage work and history Opera carries. Steohen Fry did a wonderful job in the space of his program. Deem Taylor wrote in The Music Lovers Encyclopedia in an article "WAGNER THE MONSTER"(1938) "Listening to his music one does not forgive him for what he may or may not have been .It is not a matter of forgiveness. It is a matter of being dumb with wonder that his poor brain and body did not burst under the torment of the demon of creative energy that lived inside him,struggling, clawing ,scraching to be released: tearing, schriekng at him to write the music that was in him. The miracle is that what he did in the little space of seventy years could have been done at all, even by a great genius. Is it any wonder hat he had no time to be a man?"